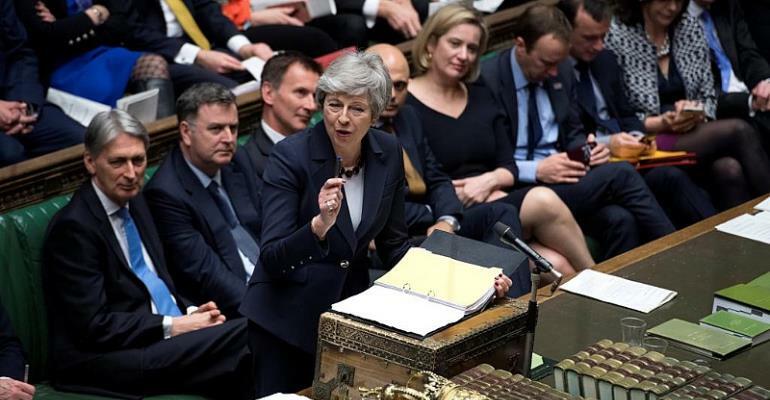 British Prime Minister Theresa May has offered to resign within weeks if MPs back her deal while, in a series of votes last night, they failed to agree on any other way to end the deadlock. The offer came just hours before the House of Commons took part in an unprecedented series of votes to seek an alternative plan -- but all eight proposals failed to find a majority, highlighting divisions among MPs. Brexit minister Steve Barclay said the outcome "strengthens our view that the deal our government has negotiated is the best option". Will her offer get the deal through? MPs have twice rejected May's Brexit deal, both times by large majorities, prompting the leader to announce what is expected to be her final offer. "I know there is a desire for a new approach -- and new leadership -- in the second phase of the Brexit negotiations and I won't stand in the way of that," she told a packed meeting of her Conservative MPs. There are signs of softening among her rebel MPs, with a number of Eurosceptics performing a U-turn including former foreign secretary Boris Johnson -- a likely contender to replace May -- who told fellow MPs on Wednesday he would support the deal. But her offer may not be enough to win round some hardliners, including a group of Conservatives reported to call themselves "The Spartans" who are still holding out -- as is the Democratic Unionist Party, the Northern Irish party which props up May's government. The DUP says the "backstop" plan in the deal to keep open the border with EU member Ireland after Brexit poses an "unacceptable threat" to the United Kingdom's political union. If her deal is passed by MPs, Brexit will happen on May 22 -- but if not, she must return to Brussels before April 12 to explain what happens next. Frustrated by May's refusal to change strategy, backbench MPs staged their own series of votes. A proposal to put May's deal, if agreed, to a "confirmatory" public vote also came close to passing, defeated by 295 to 268 votes -- a result that drew huge cheers in the Commons. Time has now been set aside on Monday for MPs to try and whittle down the most popular options -- however, the motions are not binding on May.